Over the last several years bacon has leapt from the meat aisle to nearly every segment of the food and beverage market. There’s bacon-infused Bakon vodka (not to be confused with Bacon flavored vodka), bacon candy, and even (kosher!) Bacon Salt. 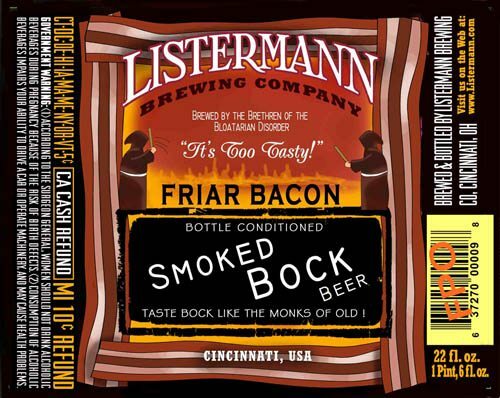 Friar Bacon Bottle Conditioned Smoked Bock beer, brewed by Cincinnati’s Listermann Brewing Co., looks to fall into the same category as the latter, as Friar Bacon merely emulates bacon’s flavor without containing any actual bacon. Like Bacon Salt, Friar Bacon certainly capitalizes on bacon imagery. Note the four slices of porcine goodness framing the label, and the punny name that seems as much an ode to a bacon fryer as it is to playwright Robert Greene’s magi-comic sixteenth-century friar. Beer Advocate gives Friar Bacon a grade of “B” and notes it does contain a certain mysterious element of smoked meat flavor.